About In Bloom, LTD. - In Bloom, LTD.
Jay Lugibihl, owner of In Bloom, LTD., was born and raised on a farm in rural Ohio. He learned at an early age his true passion for all things green and growing. He continued to cultivate his distinctive appreciation for flowers during a year long internship abroad. It was in Holland in the mecca of floral experience that Jay developed both his artistry and style. That gift is primary. His second honed ability is listening and translating his clients' expectations into magnificent floral products. 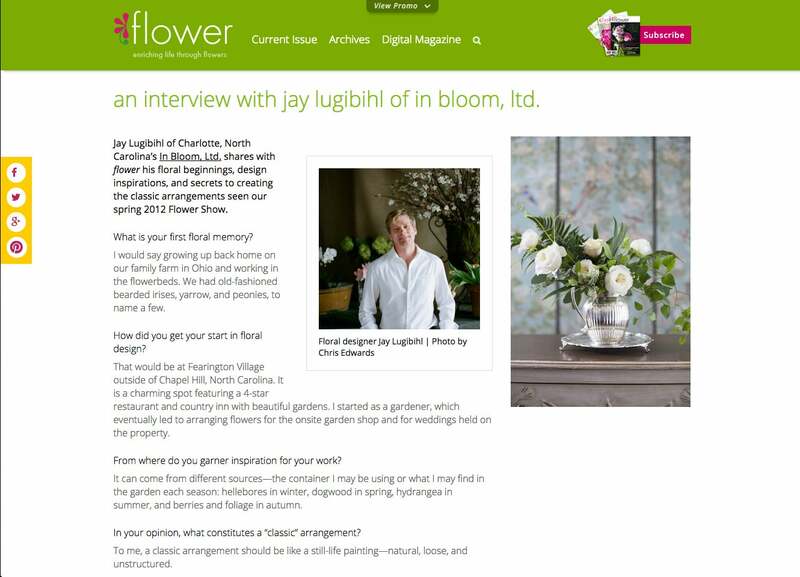 Jay has over 20 years of experience in the floral industry, including a position at the renowned Fearrington Village outside Chapel Hill, NC. From this stemmed In Bloom, Ltd., based near uptown Charlotte, NC, which Jay is owner and head designer. True imagination and natural beauty are the roots that have supported In Bloom, Ltd. These qualities are grounded in the philosophy of Jay's design. Each event is custom designed to create a perfect look, uniquely belonging to the client while always being mindful of budget. Whether a country club affair, a rustic mountain venue or an intimate home gathering, no project is too large or too small which has given Jay opportunities for work all along the East Coast. In Bloom, Ltd. has a well earned reputation for the quality of floral product used in each arrangement. Utilizing the best local and global markets, In Bloom, Ltd., hand selects each blossom. An avid gardener, Jay started cutting gardens at the back doors of his studio and his home. Here, he utilizes magnolia, annabelle hydrangeas, grasses, colorful perennials and even wild polk berry in his creations. This warehouse houses an array of rental items from vintage silver, glass and rustic elements. Jay scavenges local markets and shops to add to his growing collection of pieces that enhance his work. Although not a retail flower establishment, In Bloom, Ltd., is available to provide in-town floral arrangements daily along with global orders through B Brooks Fine Flowers network, an exclusive floral wire service.